So often in our industry, we find our competitors buying foreign scales and subassemblies and rebranding them. Mixing parts detracts from the overall quality and performance of the scale; so does buying low quality devices from overseas. At Arlyn Scales, we do not conduct business this way. When you’re looking for the best industrial bench scaleshat are made in the USA, look to an industry leader like us. Aspects of design, from conceptualizing to designing, engineering, and manufacturing subassemblies of our scales, including our bench scales, are done on site in our Long Island warehouse. In business for over thirty years, we’ve seen a lot and have spoken with business owners whose weighing equipment has failed them soon after purchase or required costly maintenance and repairs. Various industries and businesses have encountered delays, or even major halts, due to faulty equipment. We have considered each problem from load cells that cannot stand up to heavy, continual use to platforms warped by corrosive materials and scales not sensitive or responsive enough to meet the needs of certain industries — and have designed our scales to meet each and every need. Having seen it all, there are a few standard practices we have incorporated into our scale designs, as well as some state of the art technology. 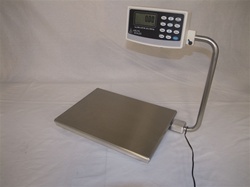 We also offer a variety of additional options to ensure that your scale functions exactly the way you need it to. A transducer is a device that converts one form of energy to another. A load cell is a type of transducer that converts force into an electrical signal. Every one of our bench scales consists of a centered load cell in an aluminum frame with a stainless steel platform. We have found that this not only supplies the user with a more accurate reading, but also protects the scale from shock and overload. Shock occurs when a load is dropped quickly from a distance onto the scale’s platform. Overload occurs when the load placed on the platform exceeds the scale’s set capacity. Constructed from stainless steel, rather than the industry standard of aluminum, and covered in a fine silicone coating, our load cells are corrosion resistant and durable. While there are many different types of load cells, bench scales typically use single point load cells that measure strain, using strain gage technology. Ideally, a load cell will act as a perfect spring, providing an output that is perfectly proportional to the weight of the load placed on it. When the load is removed, the spring should return to its initial position. However, there is really no such thing as a perfect spring element. Even when perfectly constructed, the adhesive used to bind the spring to the scale prohibits its movement. Strain gage load cells are not the appropriate choice for all weighing needs. For example, laboratories that must weigh fine particles of a substance may experience inaccurate readings from a scale equipped with strain gage technology. Due to the auto drift software that is incorporated into the scale to prevent inaccuracies from temperature or moisture, the display may not change when small amounts of a substance are added. Typically, the solution is to purchase a force restoration scale. However, this is not a viable option for many industries because these scales are extremely expensive, about ten times the cost of strain gage scales. Force restoration scales are also susceptible to temperature instability, drift, and are limited in terms of capacities greater than fifty pounds. They are also extremely prone to shock and overloading. This is why we have incorporated surface acoustic wave technology into our high precision scale options. Bench scales with our surface acoustic wave technology are as accurate as force restoration scales with accuracies of one one-hundredth of one percent, but have prices that are proportional to their strain gage counterparts, which are one third less than the prices for force restoration scales. What makes this possible is a new kind of transducer device in the load cell that measures displacement, rather than strain, resulting in strain levels that are less than ten percent of those found in strain gage load cells. A lithium niobate substrate material with a crystalline structure feeds a bulk wave that travels the length of the transducer, exciting a signal on a parallel substrate. A metalized pattern on the second substrate acts as a receiver, amplifying the signal and feeding it back to the transmitter. The frequency of oscillation between the transmitter and receiver depends on the distance between the two, which is the displacement of the spring element. Not only are surface acoustic wave scales less expensive than force restoration scales, they are also ten to twenty times more rugged due to the low strain levels required by the load cell. They are still five times more rugged than strain gage scales and competitive in cost. This means that surface acoustic wave scales are suitable for harsh industrial environments. Each of our bench scales digital indicators allow for a variety of connectivity options, including Ethernet, USB, RS-232, RS-485, Set Point, Datalogging, 4-20ma analog output, and battery packs that allow for portability. Whether you want to create a network of scales, interface with your scale via a workstation PC or off-site computer, our connectivity options allow you the mobility and control you need to ensure that your operation runs as smoothly as possible. Weight data can be stored offsite where it can be sorted, grouped, and analyzed. We also offer custom weighing equipment and software that allows for automatic liquid dispensing, flow rate control, aggregate weighing, liquefied gas tank monitoring, parts counting and bin weighing for inventory control. If one of our standard scales does not meet your exact requirements, you can also speak with our design and programming experts who can craft a scale that will.